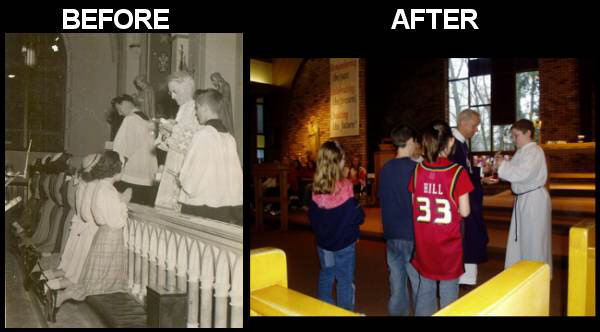 When I was growing up, Holy Days of Obligation were celebrated on the assigned day and if it fell on a week day, people managed to attend Mass, as they should, and didn’t bemoan the fact that life was so inconsiderate as to intrude on their busy work week with a trip to the church, a hour’s worth of Mass, and a sermon. Report of the Holy Day Sub-Sub-Committee of the Mass Schedule Sub-Committee of the Liturgy Committee of the National Conference Bored of the U.S. Catholic Deacons. Due to the success of moving Holy Days to Sundays in some parts of the U.S., we the above sub-sub-committee propose the following: That all Holy Days which fall on Mondays be moved to the previous Sunday in zip codes ending in odd numbers, and that all Holy Days which fall on Mondays be moved to the next Sunday in zip codes ending in even numbers. Parishes which have zip codes ending in zero will be required to hold annual ballots on December 31 in which the parishioners will decide for the forthcoming year whether they will celebrate the Holy Days on the previous or following Sunday. In the spirit of democracy and lay participation, all Bishops will be required to allow any parish which wishes to vote on whether to accept the odd/even zip code designation or to chose the Sunday of their own choice. Parishes which wish to celebrate the Holy Day on the actual feast day will need a two thirds majority of the ballots, a petition signed by 75% of the registered parishioners, baptismal certificates for 50% plus one of the registered parishioners, and first communion and confirmation certificates for at least 45% of the registered parishioners. In addition the pastor, associate pastors, deacons, Eucharistic ministers, lectors, catechists, and janitors must sign an affirmation of loyalty to the Spirit of Vatican II.